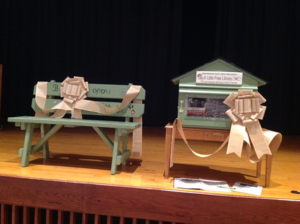 How Does WSHS’s Little Free Library Work? Take a book; give a book! WSHS’s Little Free Library offers an easy way to share great books with others: books that you would recommend to friends; books that will teach, intrigue and engage other readers and spark conversations. All of us can help by keeping this collection stocked with wonderful reading material. This library belongs to everyone in the WSHS community-- students, teachers, staff members, and other readers who we don’t even know yet! Anyone can use this library; that’s why we want to take good care of it. Take a book. WE LOVE READERS!!!!!!! If you see a book that you would like to read, take it! It’s for you! Look inside and see who donated the book and who else has read it. Maybe the last reader left a note or another reading recommendation just for you! Give a book. Your book giving is welcome at any time! When you are finished reading, return the book to our Little Free Library or pass it on to a friend. Replace the book you borrowed with one of your own. Leave a note about why you are donating this particular book for others to read…What makes this book so special? Be a friend to our Little Free Library by helping any way that you can. Pay it Forward! THE WEST SHAMOKIN WOLF PACK LOVES TO READ!!!!!!! THE WEST SHAMOKIN WOLF PACK LOVES TO SHARE GREAT BOOKS!!!!!! !